UKRAINIAN VILLAGE — Mayor Rahm Emanuel's push for the largest school consolidation in American history left Ukrainian Village photographer Jessica Rodrigue both fascinated and confused. "I've always been interested in how space is utilized, and these school closings became this huge conversation about how school space is utilized or underutilized," Rodrigue said. "Whether space is used thoughtfully or not is something that I like to investigate with a camera. If I'm confused about something, the way I learn is to make pictures." So, she hopped on her single-speed Schwinn and set out on an adventure that became something of a mission to capture a new perspective on the school closings by documenting the emptiness they leave behind. Over 26 days, Rodrigue pedaled hundreds of miles to take portraits of the 50 affected schools — focusing closest on the shuttered school buildings where the opening day bell won’t ring on Monday. "Closure" — that's what she's calls the collection. Rodrigue, 32, grew up in Lewiston, Maine, a textile mill town. Her mom stitched at the mill. Her father worked construction. Her journey into decaying Chicago uncovered so much more than that. She found that locals paid special attention when they spotted her — a pale-skinned gal feigning fearlessness as she pedaled, ponytail bouncing on her backpack, into the heart of gang turf just before sunset. Outside Emmet Elementary in Austin, an older gentlemen sitting on a porch with a buddy protected Rodrigue when a guy high on something or another headed her way. And the children she encountered, they just loved her. "Every kid I met wanted to ride my bike. They wanted to know why I was there. And when I told them, they wanted me to take their pictures," she said. "They were sweet kids, just playing with their friends." At Wentworth Elementary, two brothers — one was 5, the other a third-grader — told Rodrigue that their older sister would walk them to their new school, but they weren't sure where that would be, exactly. "They wanted to do cartwheels," she said. "And they were excited to see the pictures afterward." Rodrigue's photos show the two boys mugging for the camera, their hands twisted in weird shapes — gang signs. "I didn't know what that meant," she said. "They were just playing. They were sweet kids." At Pope Elementary, Rodrigue met an especially curious boy named "PJ." He pointed out that the school's sign had been boarded up and painted black. PJ, of course, asked Rodrigue to take his picture, so she snapped a few of him smiling on the sidewalk and after he climbed up on a brick column near the entrance to the school playground. "After I showed him the pictures, PJ asked me if I was going to show them to the police. That was bizarre to me," she said. "Why would it matter anyway. He was just playing with his friends. I still think about PJ all the time, more than any of the other kids for some reason. When he walked away it was almost as if he thought his existence was somehow criminal. He's just a nice kid." 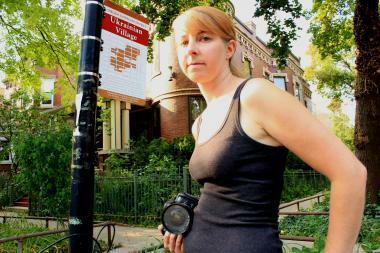 Ukranian Village photographer Jessica Rodrigue rode her bicycle to photograph school buildings that will be left shuttered by the largest school consolidation in American history, but what she really captured was the growing emptiness in the heart of what once were Chicago’s thriving middle-class neighborhoods. She did encounter a few people who seemed to fit the profile of a criminal. The guy who greeted Rodrigue as she neared Ryerson Elementary in East Garfield Park — a building that will be used to house a school of a different name when the school year starts — offered up his black market services. "He asked me what I was l looking for. If I needed something," she said. "I'm describing it in a much more polite way than it happened. I'm pretty sure he thought I was looking for drugs." There was a crowd at Ryerson. They seemed agitated. Rodrigue decided not to stop. Seconds later, that same guy started throwing bricks. "I don't know if they were thrown at me," she said. "I just looked back and pedaled away." Rodrigue suffered another scary encounter — a man ripped off his shirt while complimenting her body — outside Fermi School in South Shore. She'd rather not talk about the details. She pedaled away fast — scared, shaken and without taking any good photos. That was the worst of her days on the street documenting the buildings once used to educate so many Chicago school kids. It wasn't the norm. "I went to supposedly bad areas where people's lawns were perfectly manicured. I met more kind people in Englewood, Garfield Park and Austin than I do going to work in River North," Rodrigue said. "I rode my bike because I thought it was important to spend time in these places and not just getting out of a car taking a picture and getting back in a car. Not that me spending time there doesn’t make me an outsider. I'm still an outsider. I was just there observing." Ultimately, what Rodrigue saw — what she captured in her photographs — was the growing emptiness in the heart of what once were Chicago's thriving middle-class neighborhoods. "I've seen a lot of Chicago, but not like this," Rodrigue said. "A lot of it is so vacant and empty and vast. And it's nowhere near as unsightly as it may seem in the media. You read that all the closing schools are in African-American communities, but then to see it is so overwhelming. Seeing it for yourself is so different." The bitter battle to save those schools — all the failed protests and lawsuits — ends on Monday when kids will make their way to new schools. I asked Rodrigue what story she hoped her photographs would tell. "I guess I'm thinking about the kids. I want to make artwork accessible to them and something that they can understand," she said, pausing for a moment. "So much brick. Literally, so much brick. You see some of these schools had portable classrooms. So, at one point there wasn't enough room for all the students and now … now there's not enough kids to fill them." Rodrigue’s pictures could never tell a school's life story — they only captured their closure. Rodrigue’s journey isn’t over. 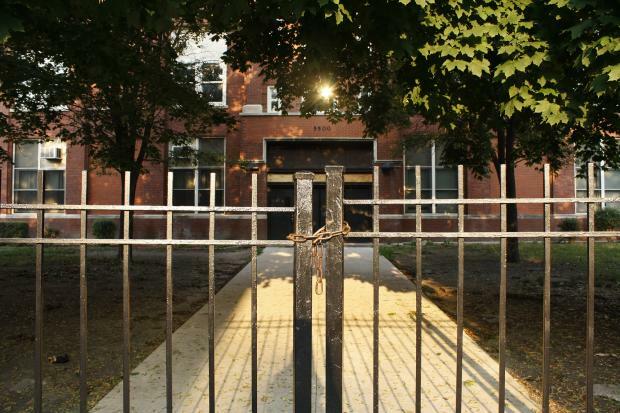 She hopes to photograph the interior of all 50 closed schools. You can find more of her photographs on her website, jessicarodrigue.net. 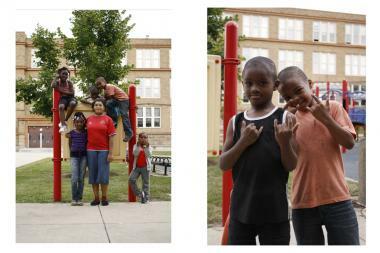 Kids mug for the camera outside Wentworth Elementary, which will merge with Altgeld School when school starts Monday.